Freightliner PL has been successful in providing haulage services to mining and energy sectors’ customers for more than 10 years. The traction and wagon fleet in our possession enables us to utilise the technical parameters of railway lines to the maximum, guaranteeing the haulage of the maximum freight volume in the shortest possible time. The mobility and flexibility of Freightliner PL, combined with innovative rolling stock, is part of our guarantee to meet customers’ expectations regarding effective and timely transport of bulk products. Innovative wagons have repeatedly proved their perfect cooperation with tipplers. For customers who prefer the delivery of smaller freight volumes, we guarantee high on-time delivery rate, which allows for the optimisation of unloading processes. At the request of the customer, thanks to the extensive network of cooperating companies, we can provide unloading and reloading services along with road transport by truck to destinations. 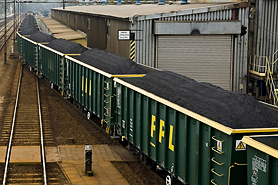 In the case of freight with lower bulk densities, Freightliner PL trains provide a larger usable volume than standard coal hopper sets. Our work organisation enables us to carry out effecting freight reloading using the side by side system at seaports and transshipment stations. Freightliner PL also offers international freight haulage services. We have locomotives with capability of running in Poland and Germany. Our trains also have permission to enter stations located in Belarus and Ukraine. We cooperate with many logistics operators in the southern area.